Gary W. Herschman is a member of Epstein Becker & Green in its Newark, N.J., office. He can be reached at gherschman@ebglaw.com. Kevin J. Ryan is a member of Epstein Becker & Green PC in its Chicago office. He can be reached at kryan@ebglaw.com. Victoria Poindexter is a principal with Hammond Hanlon Camp LLC, an independent investment banking and strategic advisory firm, in Chicago. She can be reached at vpoindexter@h2c.com. Michael Tierney is a vice president in the Chicago office of Hammond Hanlon Camp LLC. He can be reached at mtierney@h2c.com. Robert Aprill is an analyst with Provident Healthcare Partners LLC, a leading middle market investment bank, in Boston. He can be reached at raprill@providenthp.com. Michael Mahoney is an analyst with Provident Healthcare Partners in Los Angeles. He can be reached at mmahoney@providenthp.com. July, August, and September have been the most active deal months in 2017 so far, with over 299 recorded deals. That can be contrasted with the same quarter in 2016, during which only 167 deals were recorded, making it the slowest quarter that year. The three most active sectors in summer 2017 were long-term care, health-care information technology, and physician practices, as strategic and financial buyers continued to actively shop for assets. The much-discussed market uncertainty—stemming from the political environment, regulatory uncertainty, and other factors—doesn’t seem to be hindering transaction activity. 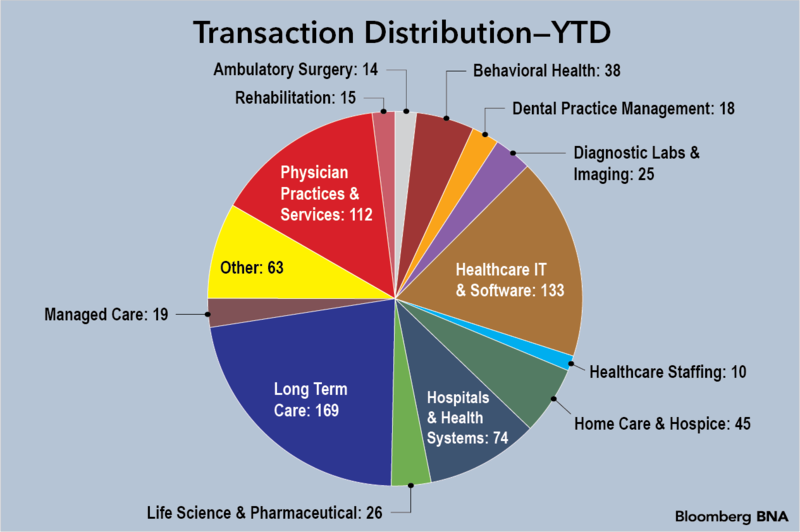 Long-term care, including home health, continues to outpace the industry, with 215 transactions year to date. The sector remains attractive for many investors looking to position their portfolios for future growth, predominantly due to demand fundamentals such as an aging U.S. population and shifting preferences of seniors. It is estimated that 10,000 U.S. residents turn 65 each day, adding to an already sizable population demographic that historically utilizes the vast majority of health-care spending. In particular, as the U.S. health-care system increasingly places emphasis on efficient outcomes and lowering cost of care, long-term care will offer a critical value proposition as an effective means of reducing the number of acute-care hospital visits and maintaining the overall health of seniors. Of note in the third quarter was BlueMountain’s $700 million purchase of skilled nursing and assisted living assets from Kindred Healthcare. Continued interest and heightened activity are expected in this sector. Historically, large independent physician networks looking to partner with either a strategic or financial sponsor were limited in their options—mainly larger physician groups and local health systems. The landscape has quickly evolved as more organizations are seeing the value in controlling large patient populations. Private equity buyers and insurance giants are increasingly interested in physician groups and are willing to purchase partial or complete interests at a premium. In the third quarter, Ares Capital invested $1.45 billion in DuPage Medical Group, a multi-specialty practice in Illinois previously owned by the private equity group Summit Partners. Financial sponsors see an opportunity to leverage size and scale through acquisition and de novo growth, to increase patient populations and capture added revenues in a changing reimbursement environment. In April, Optum, a subsidiary of UnitedHealth Group, purchased American Health Network, a 300-physician practice in Indiana for $184 million. The insurer’s strategy is to control the delivery and cost of health care in all settings outside of the hospital. Strategic buyers such as hospitals continue to actively recruit independent physicians, but are increasingly disadvantaged when forced to compete with the deep pockets of private equity investors and large insurers. Further compounding the problem for hospitals are the fair market value requirements that, by regulation, limit physician compensation options. 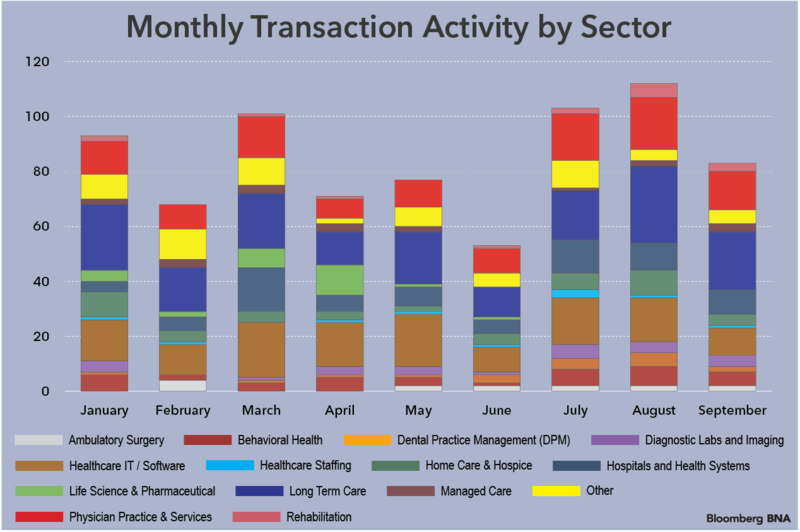 The single specialty provider space has experienced some of the highest activity in all of health-care services. With over 100 single specialty practices completing or announcing a transaction so far in 2017, independent physician groups are viewing an active mergers and acquisitions marketplace as an opportunity to secure future growth and viability. A growing shift away from a hospital setting has increased the negotiating power of private practitioners and many are turning to private equity partners as a way to further increase their geographic footprint through aggressive growth strategies. More and more groups are expected to pursue partnership and sale options as physicians continue to witness these large transaction values. Bigger isn’t always better, but when it comes to hospital transactions, there is a market for sizable assets. In this quarter, Ascension Health, the country’s largest health system, emerged as the buyer of the struggling Presence Health in the Chicago area. Despite Presence’s poor operations, it was able to align with a financially strong provider because it offered immediate scale in the Chicago market. With this transaction, Ascension, through its Amita Health joint venture with Adventist, vaulted up the market-share list from number four (8.1 percent) to number one (18.8 percent), according to Presence Health’s 2016 official statement. Acquiring and maintaining strong market share will continue to be a significant driver of financial success, thus the opportunity to immediately acquire scale through an acquisition will always be attractive. For many years, experts have thought that technology would be the key to driving value (high quality at a low cost). 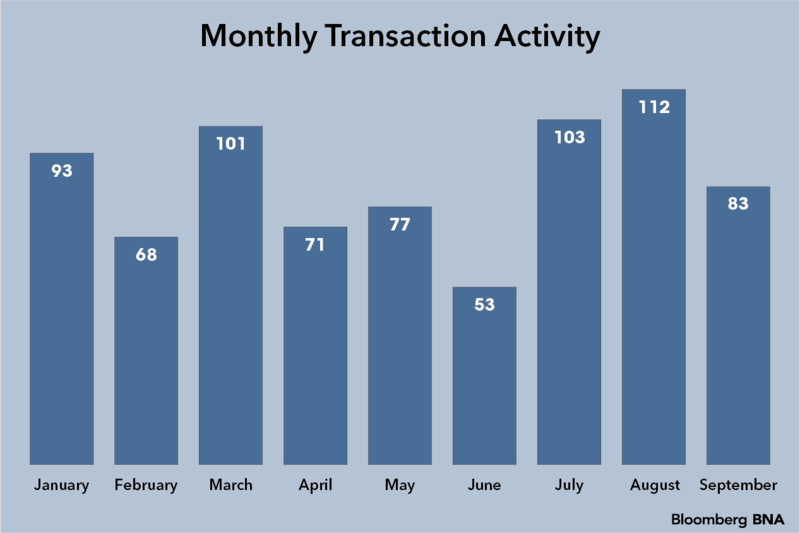 The activity in this space demonstrates the truth of that belief as there have been 133 transactions year to date. Notably, large private equity players have been active. Clayton, Dubilier & Rice Inc., a private equity firm, acquired Carestream Dental in the third quarter, purchasing the dental imaging and practice management company with an eye toward growth, and expecting to leverage the technological expertise to grow the business. While the summer months remained active, we believe the market will stay strong through the end of the year. Activity spawns more activity, and sellers are undoubtedly attracted to the high valuation multiples offered by buyers with tremendous access to capital and few investment options more attractive than health care. 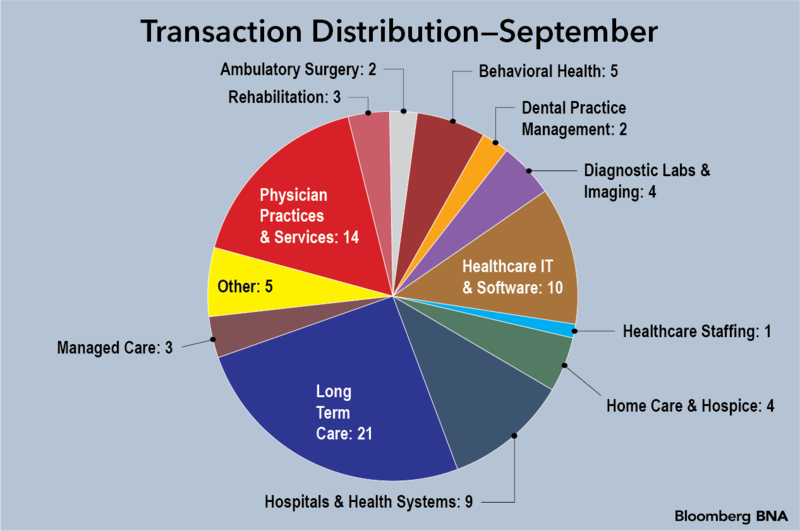 The lists of select transactions involving health-care providers, managed care and services companies for September 2017 and for 2017 year-to-date were compiled by health-care investment bankers using publicly available information, including articles, websites and press releases. The September list is at http://src.bna.com/tEe. The year-to-date list is at http://src.bna.com/tEf.Bloomberg BNA would like to thank its Health Care Transactions Editorial Committee for their guidance: Gary W. Herschman, of Epstein, Becker & Green PC, Newark ( gherschman@ebglaw.com); Kevin J. Ryan, of Epstein, Becker & Green PC, Chicago ( kyan@ebglaw.com); Victoria Poindexter, of Hammond Hanlon Camp LLC, Chicago ( vpoindexter@h2c.com); Mike Tierney, of Hammond Hanlon Camp LLC, Chicago ( mtierney@h2c.com), Robert Aprill, of Provident Healthcare Partners LLC, Boston ( raprill@providenthp.com) and Michael Mahoney, of Provident Healthcare Partners, Los Angeles ( mmahoney@providenthp.com).Epstein, Becker & Green PC did not comment on any particular transaction or party discussed or listed in this article.